This quilt was made by joining seven Blue-Eyed Grass flowers with nine hexagonal connectors. The final shape of the quilt resembles the interior of a beehive. Both the flowers and the connectors are my design. They were folded from hexagons cut from 6" (150 mm) of tant paper. The joining method is strong and the quilt does not require glue to stay together. 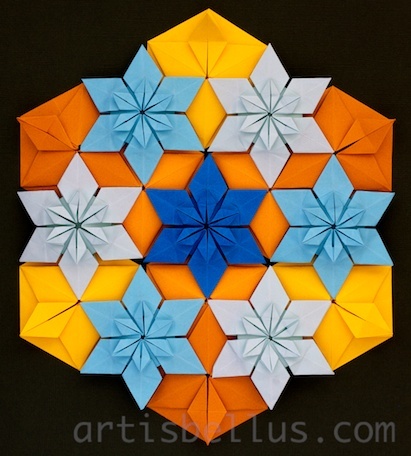 For the flowers, I used different shades of blue tant paper (Japanese Tant Origami Paper- 12 Shades of Blue 6 Inch Square ), and for the connectors, I used different shades of yellow tant paper (Japanese Tant Origami Paper- 12 Shades of Yellow 6 Inch Square ). The model Blue-Eyed Grass flower originated from using, in other regular polygons, the same folding sequence as in my model Wildlflower. The polygons/flowers that I've folded so far with the same folding sequence are (see the picture below): triangle/Spring Flower, square/Wildflower, pentagon/Pimpernel, hexagon/Blue-Eyed Grass, heptagon/Hepatica, and octagon/Single Dahlia. 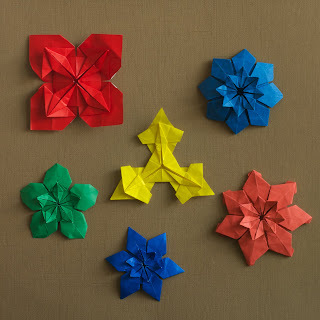 Origami models provide an interesting and inexpensive way of decorating a table for a special occasion, or just to break the everyday routine. The great availability of paper colors and textures will help you set up the mood for the occasion. 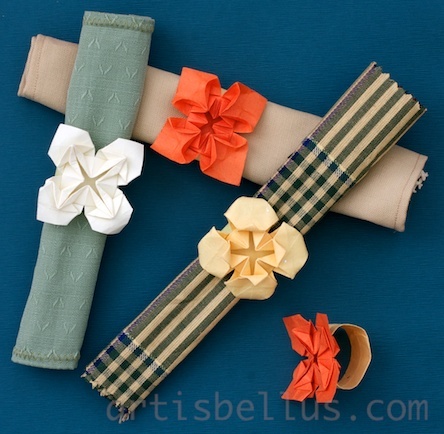 You can choose paper in different shades yellow, orange, and green for Thanksgiving or a fall party. Bright red and pink will be perfect for Valentine's Day. Red, gold, and green will decorate a Christmas table. Pastel shades of yellow, pink, and light blue will complement a Baby Shower party. And white, of course, will make a nice touch for a Wedding. 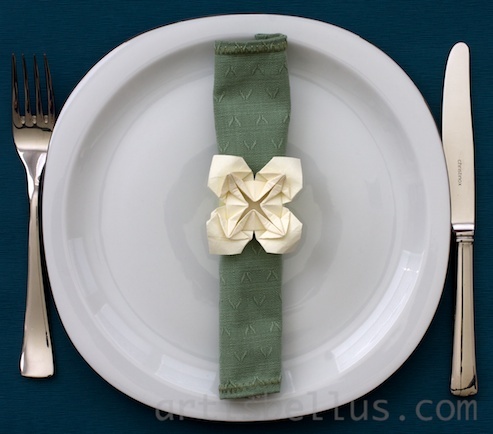 To assembly the napkin ring you will need one Wildflower, folded from a 4"(100 mm) square, and one connector, folded from a 2"x 4" (50 mm x 100 mm) rectangle. For the models in the pictures, I used washi paper in pastel shades of yellow and orange. You can change the length of the connector to accomodate the diameter of the ring to the size of your napkin. 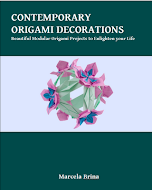 As shown in the photograph above, you can replace the Wildflower with any of the following flowers from my book Contemporary Origami Decorations : Bicolor Wildflower, Bluet, Bicolor Bluet, and Tropical Flower. Just follow the guidelines in the "Mix and match" section of the book to select the appropriate paper size. The following video shows how to fold and assemble the napkin ring, including how to fold a Wildflower. The Wildflower diagram is also available here. For the purpose of clarity, I used bigger paper in the video. If you fold the ring from a smaller paper, for example a 2" (50 mm) square for the Wildflower, and a 1"x 2 1/2" (25 mm x 62 mm) rectangle for the connector, you will end up with a ring you can wear on your finger. An origami quilt is a particular type of modular origami that is made by joining flat modules to obtain beautiful geometric patterns, similar to the tiles in a quilt. If framed, quilts will make colorful decorations for your walls. 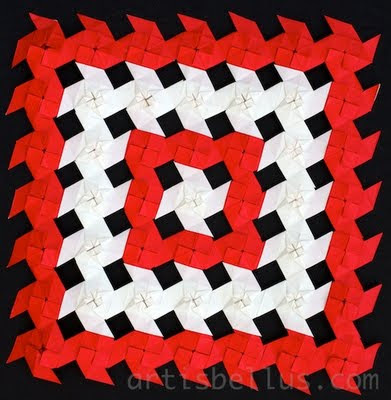 Smaller quilts, made with just a few units, can be used as coasters, or as decorations in scrapbook pages and greeting cards. You can also make unusual decorative objects by shaping them like cylinders. I made these quilts with modules that I called " double windmills", and a variation of them, both designed by me. The different patterns are obtained by changing the way in which I connected the modules. 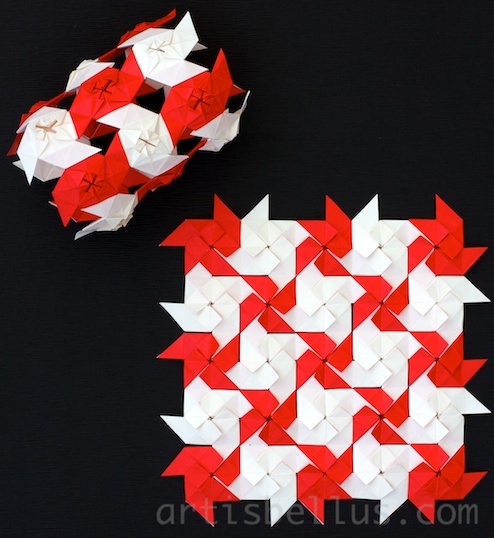 Each module was folded with regular origami paper 3"x 3" (75 mm x 75 mm). A lot of work, but so much fun! 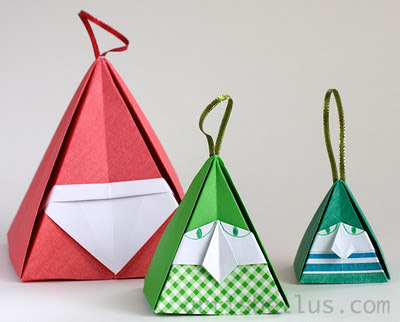 Are you one of those who cannot avoid folding every piece of paper that comes into your hand? Well, I am. That's the case when I have candy wrappers available. I particularly like the foil-glassine or foil-wax paper wrappers. They behave like tissue-foil paper, folding nicely and holding the shape. The models in the picture were folded with cookie (alfajor) wrapping paper, that is approximately 5 1/2" x 7 1/2". The boat and the hen are traditional models. They were designed for a 3:2 rectangle. I found the diagrams in the book Origami, el arte del papel plegado , by A. van Breda, but they are most likely available in many other books. The peacock was designed by Adolfo Cerceda. It was designed for a 2:1 rectangle. Because I used a shorter rectangle, it looks more like a regular turkey than a peacock. 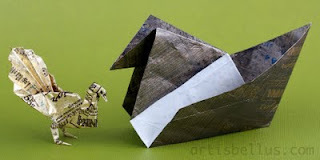 The diagram is available in the book Fascinating Origami. 101 models by Adolfo Cerceda , by Vicente Palacios.